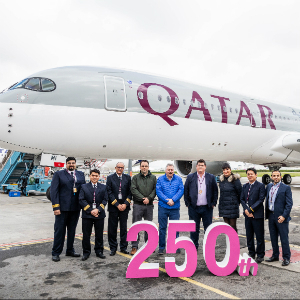 Earlier this week the Doha based Qatar Airways celebrated the arrival of its 250th aircraft! The latest aeronautical addition to the airlines fleet was a brand new Airbus A350-900 aircraft from Toulouse, France. This impressive fleet number comes after just 22 since the carrier began its operations, and is a testament to the incredible growth of an airline that has become world-leading in that time, winning a host of awards, including the Skytrax World Airline of the Year accolade on no less than four occasions. Commenting on the achievement, Qatar Airways Group Chief Executive, His Excellency Mr Akbar Al Baker, said: “I am extremely proud that we have reached this historic landmark of having a fleet that now numbers 250 aircraft. The delivery of our newest Airbus A350-900 is a mark of the outstanding growth we have seen over the last two decades, and to our commitment to flying only the newest and most technologically advanced aircraft in the world.